That sidebar of yours is prime real estate. Treat your above the fold like a high end uptown loft with a door man. And below the fold that’s a great space too, a little more modest but still prime real estate. Ad space can also fall under your header, on the footer, and even in between posts. So sell that ad space. Target companies that fall in your niche. ex. If you are a DIY crafty blogger contact craft suppliers, etsy business’s, hidden gems in your niche. You will need to do a little cold emailing or calling. Here is a sample pitch. Do a google search of keywords that pertain to your niche, see those business ads that pop up on the sidebar. Those are good places to target as potential advertisements on your own blog. When business’s contact you for PR work, campaigns, inquiries, etc. 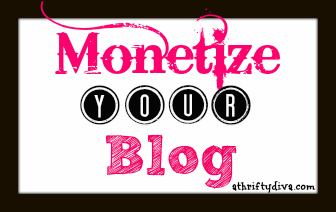 pitch them a space on your blog. There is no set rate for what any of us should charge, but for the love of all bloggers please don’t give your ad space away for FREE to a business. A good place to start when deciding what to charge is by your monthly page views. I find Google Analytics to be the most reliable source. I’m going to share with you my fee for a sidebar spot. 12,000 monthly page views $50 for (1) month of ad space. Even when I had a couple of thousand monthly page views I could still secure a spot for $25. Affiliate networks can also be a source for ad space and affiliate linking. My favorite ad network. I use escalate for so many different reasons and they are so versatile with blogs across the board. Here is an example of escalate in action as a blog post on my blog. A sidebar ad or post on a Quilters Cruise Giveaway will score you $.42 for every person that enters. A sidebar ad or post on FabKids 3-piece outfit for $25. Will score you $16 if a reader makes a purchase. Pays on the 15th with a $25 threshold. I have been set up with google adsense for 2 years and it took me 23 months to receive a check. On month 23 I had my blog optimized by a fellow blogger and in (1) month earned a check of $111.12. Why? because I had no idea that optimizing my ads to fit my blog would make such a huge impact. The size and placement of your ads can do wonders for click troughs on your blog. If you have AdSense I highly encourage you to read up on optimization or contact my guru blog friend Heather at BubbaMack. I use mysavings mostly for coupon affiliate links. They have a great coupon tool for coupon network, smartsource, redplum, savingstar and coupons.com. You can also find Recipes from American family and other great offers. I have tried plenty of other affiliate networks, they have either failed or don’t rank well among bloggers. I have found these to be the best all around. If you have any questions please feel free to share them with me. We will move on tomorrow with the best places to find Sponsored Posts and Paid Reviews. Blogging For Free! How Much is your post worth?